Hi there! 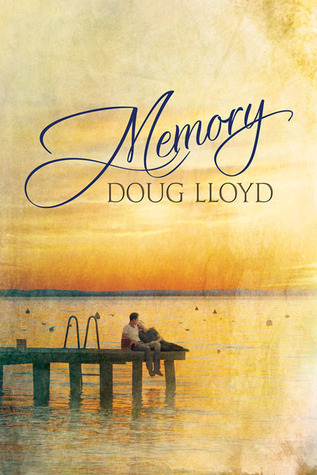 Today I’m sharing a historical M/M romance from Doug Lloyd. MEMORY is set in Boston 1952–and features a Korean War vet, and the man he meets upon his return. It’s a sad-sweet story centered on personal freedom and frustrating social mores. Paul Nelson, a military veteran home from Korea, refuses to stand by and watch Kenneth Pittman, a young man he’s just met, get beat up by a group of teens. After a few chance encounters with Kenneth, Paul questions parts of his identity he’s been trying to suppress, and despite his struggles re-acclimating to civilian life and his personal fears, Paul finds the courage to ask Kenneth on a date. The two then begin a relationship. But in the 1950s, cultural and societal norms threaten openly gay men. Paul and Kenneth can only see each other in secret, and Paul’s new boss, a former investigative journalist and proud bigot, has a habit of meddling in his employees’ lives. After tragedy strikes close to home, the two men question whether their slice of happiness is worth the trouble or if safety is more important. After vacationing together in Provincetown, a gay haven, to escape the chaos, they decide to stick it out, only to return to the consequences of being outed to everyone they know. Ultimately, Paul realizes the freedom he fought for should apply to them too, and he must bravely act in defiance of society’s expectations to be with the man he loves. I got drawn into this story because I adore historical fiction. The setting, Boston 1952, was fully accessible to me as I grew up in an urban area listening to my aunts, uncles, and father talk about their cable car adventures and soda shops. Having three uncles and a father who served in the armed forces (between Korea and Vietnam) I was also drawn to the plight of a veteran returning from war. Paul is confused. He just spent 18 months in Korea, fighting for a purpose he didn’t understand. Unlike WWII, the fighting in Korea didn’t seem to be Good v. Horrendous Evil. There were lots of gray zones, and it really didn’t help that both of his parents died while he was overseas. His younger brother, Dave, is away at Yale when he returns to their neighborhood via bus. Almost immediately, Paul is drawn into conflict–saving a man from a beating in an alley a few blocks from his home. The streetwise brawlers weren’t happy to have their “fairy” prey escape, but Paul is a sturdy man, and still dressed in his army uniform. He prevails. Ken, the man he saved, was thankful, but gruff. While airing out his empty house, Paul ponders the meaning of the war, and his own conflicted feelings about men and women. He’s only been with women, but has never been much attracted to them. In the war, there were men who had relations with other men–always under cover. It was seen as acceptable given that no women were present. But now, here in America, land of the free for which he put his life in the line, Paul doesn’t feel so free. Paul takes a job in the city as a junior editor for a newspaper. His boss is a loudmouthed bigot who rails against women, “darkies” and gays, while having an outrageous office affair with his secretary. His childhood friend, Billy, with whom Paul served in Korea, thinks nothing of running down the homos, especially after a hate crime is committed in a nearby (suspected) gay bar. Clearly, the morality of these people is in conflict with Paul’s burgeoning awareness. Paul, for his part, is filled with righteous indignation. He fought for freedom, but can’t be free to love the way that he wants. He gets a brief taste of freedom when he and Ken travel to Provincetown for a long weekend to write a travel review for his paper. There, the community is gay-friendly–having been settled by free-loving artists and bohemians. It is almost too good to be true, in fact. The differences between the life Paul wants to lead and the one society is pressing upon him are too great for him to stand. I really liked this. The quietly-building romance is tender. Paul takes a lot of time to consider his feelings. He makes mistakes, and he makes amends. He deals with the toxic people in his life, and he finds the courage to be who he really is–finding people who will support him. There was a twist at the end that nearly killed me, as a reader, but the epilogue earned my heart back. Doug Lloyd is an author in his late twenties who moonlights as an attorney and business consultant in his spare time. Despite his many attempts to be artistic (music, drawing, film, clay arts), he has found writing to be the only creative outlet he is marginally good at. He is a trivia sponge—a trait which tends to make writing novels take substantially longer during research—and former *Jeopardy! * one-day champion. Despite being born and raised and living his whole life in the Boston area, he is not a fan of the cold weather and snow and plans on one day moving someplace where the climate is a bit more balanced. Until then, he continues to wear one of his many orange sweaters during the winter months. Doug enjoys writing across many different genres—romance, thriller, science fiction, and more—though his works tend to feature LGBT characters in major roles. When not clacking away at the keyboard, Doug spends time with his husband Eric and their three pets in Massachusetts, where they live. He is also an avid board- and video-game enthusiast, chef in his own mind, chocoholic, and insomniac. You can find Doug online on Facebook, or via email: authordouglloyd (at) gmail (dot) com.